I think one of the hardest things to shop for is rugs. A lot of them are ugly and the ones that aren't are expensive, or they're not the right size, or they're not the right color, or they're flat weave, etc, etc. I actually really like flat weave, because they're usually more colorful and the patterns are more intricate, but I find them difficult to clean and vacuum. And with two cats who constantly puke up hairballs, they need to be cleaned constantly. 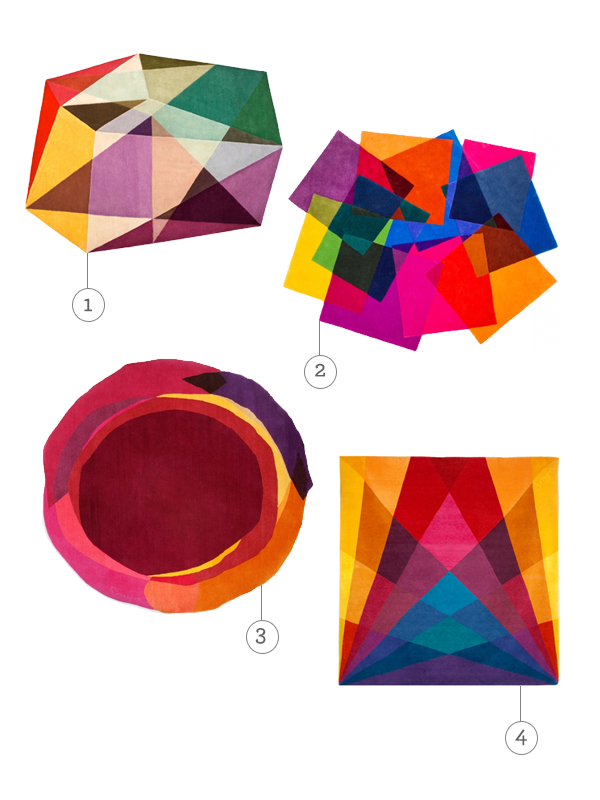 Sonya Winner creates exceptional rugs that are graphic, vibrant and highly original. Her first rug, The Kaleidoscope, caused a sensation when it first went on sale at The Aram Store in 2006, and was promptly shortlisted for an Elle Decoration award. It has been a favourite with discerning buyers, stylists and celebrities ever since. I wish I could have one, but with prices ranging from $900 for a small 3'x3'ft all the way to $5000 for a 8' x 9' ft rug, they're way out of my price range.